Fee: $400/$360 for members of the Lynden Sculpture Garden or Woodland Pattern Book Center (only one discount applies). Fee includes admission to Fiffer’s reading and lunch on Saturday & Sunday. Registration: Registration is now closed. If you have any questions, please contact Polly Morris at pmorris@lyndensculpturegarden.org or 414-446-8794. Lodging Package: A block of rooms will be available at the Plaza Hotel in downtown Milwaukee at very reasonable rates. Check back soon for more information and reservation deadlines. Are you writing a mystery, memoir, or a literary novel? Have you begun a collection of short stories? Are you revising your novel for the third time or are you struggling with the first draft? All writers, at any stage of their work, are welcome to participate in a weekend intensive with Sharon Fiffer, author of the Jane Wheel mysteries and a popular blog, What I Learned At The EZ Way Inn. Begin by embarking on a junking junket around Milwaukee with Sharon Fiffer and Anne Kingsbury of Woodland Pattern. Fiffer will introduce you to the world of her character, Jane Wheel--antiques picker and private investigator. Much of Fiffer's fiction is based on childhood memories of growing up in Kankakee, Illinois and the objects she finds on her own junking expeditions. She will guide you through treasure hunting “research,” talk about the relationship between found objects and creative memory, and help you find some good stuff! On Saturday and Sunday the workshop moves to the Lynden Sculpture Garden, where you will discover your hidden story. Sharon Fiffer’s residency is a collaboration between Lynden Sculpture Garden and the Woodland Pattern Book Center. In addition to the workshop, Fiffer will offer a reading at Woodland Pattern on March 8 at 7 pm. The weekend will conclude at Lynden with a free, informal reading (followed by a reception) by workshop participants on Sunday, March 10 at 2 pm. Both of these events are open to the public. Tickets for the Friday reading are available from Woodland Pattern at (414) 263-5001. All activities take place at the Lynden Sculpture Garden unless otherwise indicated. 2 pm: Welcome and assemble for Junk Junket at Woodland Pattern Book Center, 720 E. Locust St., Milwaukee, WI 53212. 5 pm: Dinner (location TBA). 5 pm: Reading by Sharon Fiffer at Woodland Pattern. 10 am-12 pm: Getting started. 12 pm -1 pm: Lunch (provided by MKELocalicious). 1 pm-5 pm: The first chapter. 8 pm: EZ Way Inn Outing (optional). 9 am-12 pm: Writing in short form. 1-2 pm: Prepare for reading. The weekend will kick off Friday afternoon with a junking junket with Sharon Fiffer and Anne Kingsbury of Woodland Pattern (Jane Wheel, after all, is known as a PPI: picker, private investigator). Sharon and Anne will take you to some of Milwaukee’s finest junking spots—and perhaps you’ll acquire an object you’d like to write about over the weekend. The group will stop for dinner prior to a reading by Sharon Fiffer at Woodland Pattern. Fiffer will read from her latest Jane Wheel mystery, an essay about transitioning into a mystery writer, and excerpts from other works. Discussion to follow. On Saturday, the group convenes at the Lynden Sculpture Garden. In the morning: Getting started. The first sentence. The first paragraph. The first page. Everyone has a story. We will discuss finding yours. Whether you want to tell your story in fiction--as a short story or novel or as a memoir--every story begins with the first sentence, the first paragraph, the first page. And that's where we will begin. Writing from memory, finding your voice, figuring out what comes next and exercises to boost your creativity will all be covered in our workshop. Beginners and seasoned writers alike--we all start each writing day by putting pen to paper (or fingers to keyboard) and that's what we will do this morning. We will write, read, discuss, wring our hands and gnash our teeth. In the afternoon: The first chapter. How to tell your story--what to tell and what not to tell. We will discuss plotting a novel--and, quite similarly, structuring a memoir. Various examples of structuring your work will be discussed and we will work on "timelines" for your pieces. Writing shorter pieces? Personal essays? Blog posts? Structure is vital since it will help you decide how to select your topics and the best, truest way to express yourself. We will write, read, discuss, and if necessary, continue our wringing and gnashing. Yes, writing is hard. However, telling your story just might change the world. In other words, writing your story is worth it. After dinner on your own, participants are invited to reassemble for an optional outing at an appropriately EZ Way Inn-ish Milwaukee nightspot. Sunday morning: Writing in short form. From fact to fiction to memoir. That's how I used my own experiences, my own story in my work. I'll share some of the ways in which I loaned my life to my fictional character, Jane Wheel, and how I discovered a structure in which to reclaim the material for a memoir, which I am excerpting on my blog under "What I Learned At The E Z Way Inn." We will discuss reading one's own work--how to present and how to feel (mostly) comfortable reading one's work, and we’ll select pieces to read at the informal event this afternoon (friends and family welcome). We’ll finish with a reception—a chance for informal chatting and follow up. "Killer Stuff is one of the funnest reads I have had in years. All of Sharon Fiffer's characters are absolutely superbly drawn and seem so real." "Fiffer’s prose sparkles, and she knows how to tell a story. All her characters are wonderfully real people, very much like people you might actually know yourself." …Sharon Fiffer captivates her readers and leaves them wanting more. "Not only is Sharon a gifted writer, but she is also an outstanding teacher. Her instruction is both insightful and practical and her attitude is always positive, patient and encouraging. I feel lucky to be able to work with her." 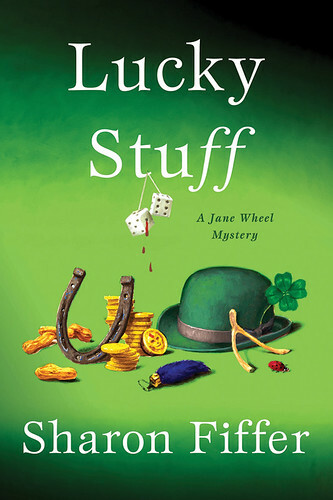 Sharon Fiffer is the author of eight Jane Wheel mysteries published by St. Martin’s Minotaur: Killer Stuff, Guy’s Stuff, The Wrong Stuff, Buried Stuff, Hollywood Stuff, Scary Stuff, Backstage Stuff, and Lucky Stuff. She is also the co-editor of three collections of literary memoirs--HOME; American Writers Remember Rooms of Their Own; FAMILY: American Writers Remember Their Own; and BODY--and co-edited the award-winning literary magazine Other Voices for eight years. Fiffer’s short fiction has been published in several literary magazines. She received an Illinois Arts Council Award for her story “The Power of Speech” and was awarded a fellowship in fiction from The Illinois Arts Council. Fiffer has taught creative writing and literature at Barat College, The University of Illinois at Chicago, and Northwestern University. With her husband, writer Steve Fiffer,she is the co-founder of the Wesley Writers Workshop where she currently teaches.